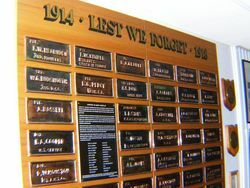 A display of plaques which were located on the Sandringham Avenue of Honour commemorates those from the district who served in World War One. The Avenues of Honour at Sandringham and Black Rock were planted on the 18th August 1917. AFTER W.W.1. THE THEN SANDRINGHAM COUNCIL ESABLISHED AVENUES OF HONOUR BETWEEN SANDRINGHAM AND BLACK ROCK WITH THE PLANTING OF HUNDREDS OF TREES - NORFOLK PINES IN BEACH ROAD AND FLOWERING GUMS IN BAY ROAD, FERNHILL ROAD AND BLUFF ROAD. 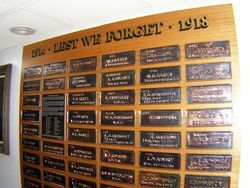 A TREE WAS ACTUALLY PLANTED FOR EACH PERSON WHO LIVED LOCALLY AND VOLUNTEERED AND SERVED ABROAD IN THE ROYAL AUSTRALAIN NAVY OR THE AUSTRALIAN IMPERIAL FORCE (A.I.F.) DURING THE GREAT WAR 1914 - 1918. MANY OF THESE PERSONS WERE KILLED OR WOUNDED. 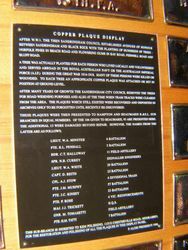 TO EACH TREE AN APPROPRIATE COPPER PLAQUE WAS ATTACHED OR SET IN POSITION AT GROUND LEVEL. AFTER MANY YEARS OF GROWTH THE SANDRINGHAM CITY COUNCIL REMOVED THE TREES FOR ROAD WIDENING PURPOSES AND ALSO AT THE TIME WHEN TRAM TRACKS WERE CLEARED FROM THE AREA. THE PLAQUES WHICH STILL EXISTED WERE RECOVERED AND DEPOSITED IN ARCHIVES ONLY TO BE FORGOTTEN UNTIL RECENTLY RE-DISCOVERED. This Sub Branch is indebted to KEM Polishing, 11/310 Chesterville Road, Moorabbin, for the restoration and polishing of all the plaques in this display panel.